"Gospel Sax Sing-Along" for Churches "Sax Tracks over the Net"
Shelton has played "a little bit of everything at one time or another" since turning pro at the age of 15, but the label of "Country & Gospel Sax" feels just fine to him. Born in Shreveport, Louisiana on April 24, 1941, Shelton was introduced to the Alto Saxophone at the age of 9 by his 4th grade "traveling music teacher." "When I came home and announced to my folks I wanted to learn to play the saxophone, Mother rode the trolley... they were electric then ...downtown where she bought my first alto in a pawn shop for $50, then took it to the music store and paid another $25 to have it overhauled. I played that horn for 6 years before my folks plunked down $325 for a King Super 20 Alto and I turned pro at the age of 15 in 1956. I ended up playing that horn for 32 years... until it was stolen in a burglary on the morning of the day before I was to move to Nashville from Houston, Texas." "I'm actually a product of the first Rock generation, starting out in the late 50's with the Dale Hawkins band. Dale was the writer/artist of "Suzie Q" and it became a big hit for him on Chess Records out of Chicago. That band produced some phenomenal musicians, including James Burton (Elvis' lead guitar), famed blues guitarist Roy Buchanan, Billy Sanford (Nashville "A-Team" studio guitarist), and Joe Osborne (west coast "premier" studio bassman). "Straight out of high school I left Shreveport for Lake Charles, Louisiana where I met Mickey Gilley and joined his band as his first Sax man. In 1960 Mickey brought me to Houston where we worked the "Ranch House Club" and did a lot of recording. Actually my first recording as an artist came about when we went in the studio to record with Mickey. His manager at the time was Leland Rogers, Kenny’s older brother. Kenny was still playing upright bass with the Bobby Doyle Trio and Leland got him to come in and play bass on the session. We had worked up a couple of instrumentals and Leland said he wanted us to cut those too. Leland named the A side “Shelton’s Blues” and we called the B side “Hot Licks”. Leland put the single out on his Ivy Records label and I actually had Kenny Rogers playing upright bass and Mickey Gilley backing me on piano. Throughout the 60's I worked with many bands of all types in Southeast Texas. 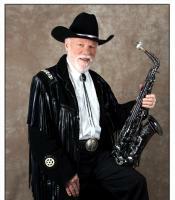 “My first full album was in 1973 when I recorded “Country Sax” for Mr. Roy Stone’s Stoneway Records in Houston. Mr. Stone pulled two singles from the LP and got considerable action in the region. "I studied at the Houston Conservatory of Music and received my Bachelor of Music degree in 1964, then went into business as an arranger-conductor-producer. Over the next 20 years I was involved in just about every facet of the music business. I had a demo recording studio and got into publishing, artist management, and finally an entertainment booking agency. "During the 80's I got involved in the world of personal computers and finally came to Nashville in 1989 to put it all together. I developed a computer program for music publishers (Music Publishing Executive) and it has been used by some of the Music Row's top publishers. "I have to say that 1999-2001 with the "Strait Gate" Southern Gospel group were really wonderful years because I was finally playing for the Lord ... something I should have been doing long ago. My first Gospel Sax album, "Hymns Of The Faith", launched a solo career which we have continued to build on with "Country Gospel Sax", and "Old Tyme Gospel Sax Sing-Along". "Music has been in my blood for many, many years now, and I look for every opportunity to play my horn ...whether it be in the studio or on stage. "The Lord has indeed blessed me with my beautiful wife Kathleen, daughter, daughter-in-law, two sons-in-law, and three wonderful grandchildren. We are members of The Metro Baptist Church in Goodlettsville." Shelton also pursued a long career in the U.S. Army Reserve and retired in 1994 with the rank of Lieutenant Colonel, Infantry. He is truly a multi-faceted person ... but most of all, his soul speaks to you through his sax.